The day started off busy when we listed a TV we don't use anymore online and had close to 50 responses. It was off the living room floor 30 minutes later and I think I can finally take some pretty good "after" shots in there for our reno link. Then Wren and I headed out to a couple fabric stores to pick up some white upholstery fabric for my latest transformation. If you have a really good memory then you probably remember me talking about slipcovering an antique sofa back in October. Well, I never actually bought the sofa I was talking about. 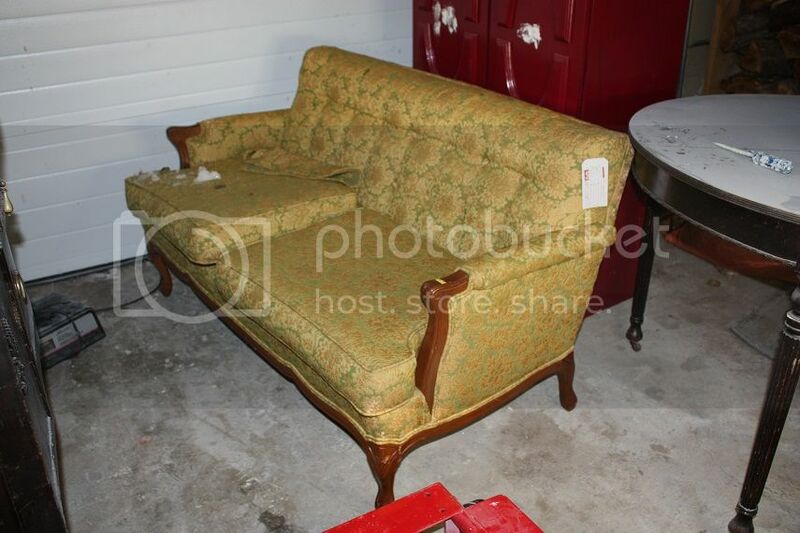 While I love that look, I did want something a little less "frilly" and so I kept my eyes peeled for a sofa without the wood scroll work on the upper part of the back. It is the perfect style, but more importantly the perfect size! I was scratching my head as to how a larger sofa would need to be positioned, but this girl will work in our master bedroom if I can't seem to get it right in the living room. But my fingers are crossed that it will play nice and stay in the living room. This is the general look we are going for with the cover. One large, down-filled cushion on the seat and a loose, relaxed fit over the arms and back. Legs still exposed. And finally, I was given marching orders by Sean to clear out the laundry room. Monday is d-day, as in demolition day!!! I have to write it up and down my arm to remind myself, but I NEED to get a before shot before the damage begins.